Head of State, de facto head of the Trade Federation Cabinet, Commander-in-Chief of Trade Federation armed forces, Lord Ambassador for the Trade Federation and Governor of all Trade Federation Territories. Appointed by the Viceroy, the Regent is first in the line of succession for the Viceroy of the Trade Federation. Right hand man to the Viceroy and second in command of the Trade Federation, the Duceroy is answerable only to the Viceroy. Ruling body of the entire Trade Federation. Answerable only to the "Roys", the Evocati Order are the force guardians of the Trade Federation. The Ministry of Defense serves as the military branch of the Trade Federation. The Ministry of the Interior's main mission is to supervise all interior operations within the Trade Federation. Such as the management of all city's and facilities that are owned by the government. 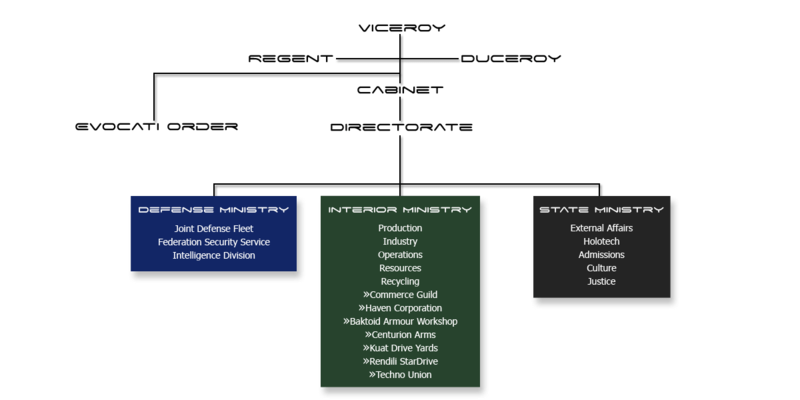 The Ministry is made up of four departments. The Department of Logistics, Industry, Resources and Admissions. The Ministry of the Production's main mission is to supervise all production within the Trade Federation. The Ministry oversees the Department Manufacturing, Naval Production, Robotics and Vehicle Engineering. The Directorate is the forum for discussing issues of governance for the Trade Federation, and to inform the Cabinet on matters of decisions. The Directorate is made up of all the Directors within the Trade Federation. The Department of the Navy consists of all space forces in the Ministry of Defence. The Federation Security Service acts as the law enforcement agency of the Trade Federation and public liaison for all security matters. The department manages shield access for all govrnment territory as well as external access to property. The Department of Industry manages all construction assignments for the vast array of planets in Federation Space. Everything from conceptual planning, construction, and city maintenance is handled through the department to ensure all operations conducted for the Trade Federation are efficiently undertaken and managed at all levels by well equipped members. The Department of Logistics, also called the Logistics Corps, is the logistical arm of the Trade Federation. This department organizes the transport of people, ships, and resources of the Federation. Over the years the Department has seen untold growth employing over half of all the governments personnel making it the biggest department of the Federation. The Department of Admissions is the combined department that handles all recruitment for the Trade Federation and administers training to all members. The Department of Resources is the Trade Federation's burly, pick wielding, hammer swinging, dirt digging, mining arm. The Department of Naval Production, composed of Kuat Drive Yards and Rendili StarDrive, is the ship production arm of the Trade Federation. The Department of Vehicle Production or as its most known as The Techno Union, is the vehicle production arm of the Trade Federation. The Department of Robotics or as its most known as The Dorinian Military Corps is the droid production arm of the Trade Federation and considered to many the most successful droid manufacture in the galaxy. The Department of Manufacturing, composed of Baktoid Armour Workshop and Centurion Arms, is the item production arm of the Trade Federation. The Department of External Affairs has the sole duty of maintaining diplomatic relations with all factions, government and commercial alike. The Department of Justice or High Court of the Federation, is the sole source of judicial authority within the Trade Federation, and also holds the responsibility for the creation of laws conforming with the ideals and values of the Trade Federation. The Department of Culture acts as the voice of the Trade Federation. The department is responsible for publishing Federation news and events and will also help write GNS posts for the Cabinet. Staffed with many skilled authors and graphic designers who use their talents to help better the Federation. The Department of Trade is the public trading arm of the Trade Federation. The Department of Trade, known as DoT in the trading realm, is created in order to facilitate the sales and trading empire of the Federation. DoT is known for helping both factions and individuals out with a plethora of options from consignment sales to handling all sales logistics for a faction. The Department of Recycling, primarily known as Haven Corporation, is the recycling arm of the Trade Federation.